I just want to share my Multiply buys and my experience in shopping through the new Multiply site. I ordered and got the items a few months ago, but there was a little concern that caused my delay in publishing my write-up. Before I go on sharing my shopping experience, let me just share what I bought from the Php1000 voucher we got from the Multiply.com Media Launch held last July. I wanted to really check how the new Multiply service works, so I chose to order from different sellers. Here are my best buys! I bought this nice underwear organizer in pink! The material is like that of the ecobags, and you guys insert cardboards on the side to make it stand. I bought two and I guess they are not enough to keep my undies! This lovely ring holder is great for display! It looks chic and would be perfect in any dresser. I got tons of shoes and I find it hard to locate them in their boxes. I bought this nice shoe holder which holds 12 pairs (but since I have such big size, one slot for heeled shoes can only keep one!). I love it just the same. I stored most of the shoes I seldom use here so I can easily check if they are still okay and in good condition. Plus, it will be easier for me to get them when needed. I have been wanting a wallet that I can use for traveling. The one that can keep and separate bills and currencies. I find this one really nice, complete with zipper and pen holder. I just got too excited that I never realized I ordered the bigger one - which is a bit bulky. I will just use it as receipts holder and bills holder to manage my finances. Multiply paid for my purchases as an online loot! Yey! Thank you! It is so easy to shop at the new site, you just add the item to your cart and settle the bill in one transaction. There is no need to fill out different order forms, or comment "MINE!" if you wanted to buy the product. After you are done with shopping, just settle it, and confirm your mailing address. There will then be a code/reference number that will be generated which you will use and note in the deposit slip when depositing your payment. I also ordered a really nice necklace with a pin up girl pendant. But after several follow ups from the seller, I still received no response. I am glad that the customer service support of Multiply is very accommodating. I even had a balance of Php200 something which I needed to deposit in the Multiply account because my total purchase exceeded Php1000. Louie, the customer support who was assisting me is very patient and understanding of my delayed deposit consistently gave me updates about the non-performance of the seller, and even tried contacting the seller to settle the transaction. It feels good to have someone you can contact to resolve issues such as this. After a couple of days, he told me Multiply has suspended the sellers account. I thought that would be enough to alert the seller of his/her non-compliance, but until now, we have not received anything from the seller. Too bad, I really want the item! As a buyer, my concern is, what if this issue involves a regular buyer? What if I am just a regular Multiply buyer who has already sent the payment to the seller? It looks like suspending the sellers account is not enough, how about recovering the payment? Good thing there is a Multiply Buyer Protection Program. You can find more info here. The buyer protection policy covers all paid but unfulfilled orders from Trusted sellers only. Also, payment should have been made via the new system (shopping cart). What a relief for someone who loves buying stuff online! Were you at the Shop@Multiply Biggest Party? I got more shopping and customer service stories to share! Stay tuned! 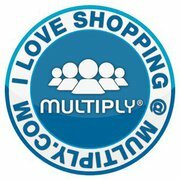 What are your great buys from the new Multiply site?